LAST EXIT is a special issue of Weird NJ Magazine which was complied and edited by Joanne Austin and illustrated by Ryan Doan. 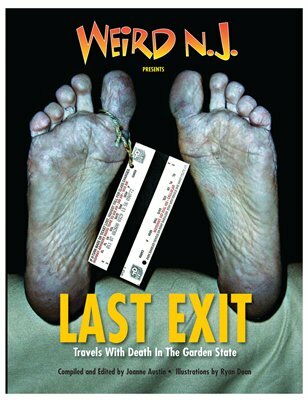 Take a stylish ride to the other side with Weird NJ as we venture off to the Last Exit: Travels with Death in the Garden State. Some of what we'll see: New Jersey’s funniest, wordiest, most poignant, and most fascinating headstones; its spookiest burial grounds; its stranger burials; its coolest death rides; its oddest deaths; places where famous (and not so famous) people and animals are buried; cemeteries that have become lost despite being located in the most populous state in the Union; and the most vile of grave defilers. And it's all set up as if we were traveling along New Jersey's most iconic (and sometimes considered hellish) highway, with a bit of classic literature alluded to once in a while for good measure (see, it's educational, too). Admit it. You're DYING to go on this trip with us.